Days of Our Lives (DOOL) spoilers for Wednesday, November 8, tease that Eve (Kassie DePaiva) will have a real mess on her hands. Thanks to Brady (Eric Martsolf), Eve will face questions from the police. Brady will make sure the cops notice the amulet he planted in Eve’s purse. He’ll suggest that Rafe (Galen Gering) and Eli (Lamon Archey) should lock Eve up right away. Eve will insist that she’s been framed. Days spoilers state that Eve will share an airtight alibi and blow Brady’s plan in the process. When Victor (John Aniston) gets updates on Brady’s latest scheme, he’ll be furious. Victor wanted Brady to get rid of Eve, but not like this. Now they could both be under suspicion for Deimos’ (Vincent Irizarry) murder. Elsewhere, Claire (Olivia Rose Keegan) will struggle with some highs and lows. The good news is Claire will have a hit song online and she’ll rack up plenty of views. The bad news is Theo (Kyler Pettis) could cause a bit of trouble for her. Since Theo will be in danger later this week, perhaps DOOL wants to set up some conflict beforehand. It could add to Claire’s guilt when Theo lands in harm’s way. Meanwhile, Kate (Lauren Koslow) will eavesdrop on an intriguing conversation. She’ll listen in on Steve (Stephen Nichols) and Kayla’s (Mary Beth Evans) chat about Tripp (Lucas Adams). Days of Our Lives spoilers say Kate will approach Kayla to fish for info. She’ll learn a secret that could really shake things up for Tripp. This might tie in with Tripp’s manipulation at the hospital or the attack on Kayla. When the time is right, you can bet that Kate will use this dirt against him. Tripp will face a fierce blackmail threat next week, so stay tuned for all the drama. Across town, Gabi (Camila Banus) will fill Abigail (Marci Miller) and Chad (Billy Flynn) in on the details of Kate’s offer. 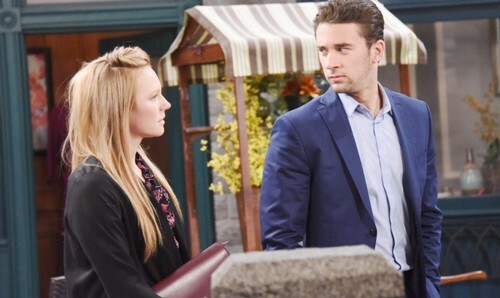 Her small business could become part of DiMera Enterprises, so Chad and Abby could be seeing a lot more of her. Days spoilers hint that they’ll all process that situation and try to figure out how they’re going to handle it. 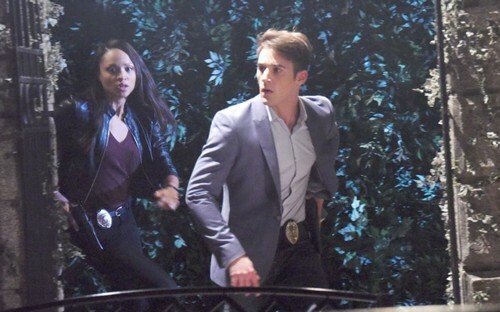 Fortunately, Gabi is falling hard for Eli. Her feelings for Chad haven’t exactly vanished, but maybe this working arrangement will help her see him as a pal again. The same goes for Abigail. Teaming up could lead to the restoration of a real friendship. Will Gabi’s latest adventure turn out well for her? Will this deal hit any snags? We’ll keep you posted as other Days of Our Lives news comes in. Stick with DOOL and don’t forget to check CDL often for the latest Days of Our Lives spoilers, updates and news.